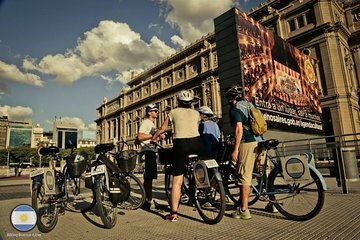 Pedal between the colonial mansions and modernist landmarks of Buenos Aires on a 4-hour bike tour of the city’s architectural highlights. Wind your way through the cobblestone streets of San Telmo, past the grand buildings of Congreso and the historic monuments of Monserrat. Hop off along the way to admire architectural wonders like the Teatro Colón, the Casa Rosada and Buenos Aires Cathedral, then cross the bridge to marvel at the futuristic skyscrapers and glitzy bars of waterfront Puerto Madero. We loved this tour!! The pace was very nice and Will was careful to keep checking with me the novice biker to be sure I was ok. The buildings we looked at were great and the guide had lots of information about the city and its architecture. A great way to see Buenos Aires from a different perspective.